The Federation of Central Universities Teachers’ Association (FEDCUTA) called a strike on Saturday, the 16th of January against the University Grants Commission’s (UGC) proposed service condition for college teachers. As a result, the mid term exam schedules in several colleges were disrupted. The contentious proposals have been outlined in the Draft Notifications on Revision of Payscales and Service Conditions, etc for the maintenance of Standards 2009. This draft talks about introducing a three tier hierarchy of Assistant Professor, Associate Professor and Professor with the number of these posts being in a fixed ratio. The teachers believe this will be inimical to their interests as their upward mobility would be restricted. The UGC has also laid emphasis on activities like campus development, consultancy projects etc. which according to teachers is the responsibility of the Administrative Department of the college. This, teachers say, will incentivise teachers to focus on activities apart from maintaining and improving the quality of teaching which is their primary responsibilty. In many colleges, including Sri Ram College of Commerce, Kirori Mal, Sri Venkateshwar, JMC and Hindu, mid term exams that were scheduled on Saturday were postponed to other later dates. However colleges such as Hansraj, Miranda House and Ramjas among others remained unaffected and continued with their examination schedule as planned. Several students were pleased with the effective prolonging of their preparatory leaves. However, many other students were left fuming due to the postponement. A student of a North Campus college said, “These strikes are really getting ridiculous now. They are causing a lot of harm to the students who have been preparing for the exams and the administrators and teachers who planned the datesheets. I just want the exams to end, not be extended for so long for no apparent reason.” A teacher contended that when ridiculous and unfair laws come into practice they need must protest against it, even if it inconveniences a few people. 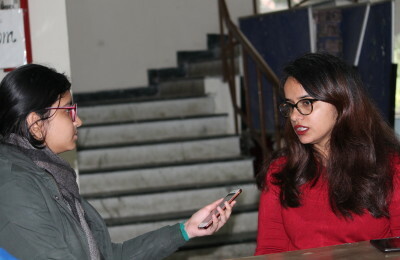 She said that students should be aware of the reason behind the strikes, which is a matter of concern for them as well, and should join the initiative rather than condemn it.